The previous 6 blog posts were all about the EZeeBUY™ products and services in the category of EZeeBUY™ App Core services. The EZeeBUY™ vision is to become the world’s most trusted buying platform for any product, using your smartphone camera, while delivering the best price and buying experience. The EZeePRODUCT™ global product catalog will be the core service that delivers that vision: a patent pending global product catalog of the entire e-Merchant world, as though they are in a single store, creating a trusted Global Marketplace-Economy™ that offers the best price or fastest delivery with guaranteed inventory. Using cutting-edge technologies and patent pending processes, we will index the e-Merchant universe making virtually any product available at your fingertips. 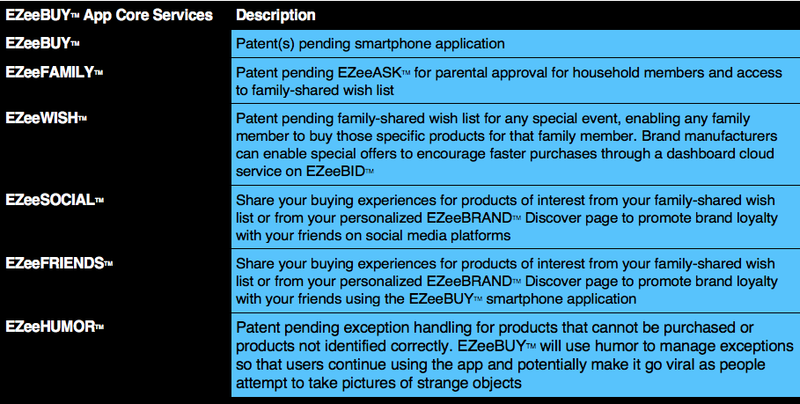 When taking a picture with the EZeeBUY™ smartphone application, the EZeeDiNA™ deep learning algorithm (discussed in a future blog) will identify the product in milliseconds while instantly searching the patent pending EZeePRODUCT™ global product catalog platform to retrieve product details, pricing and availability for the best price or fastest delivery — resulting in a simple one-touch BUY now experience! The EZeePRODUCT™ global product catalog also serves to solve for the unnatural buying experience. Many surveys conclude that having a happy buying experience makes the shopper spend more, and more frequently. Experts also tell us, that in general, people shopping online are not very happy with the shopping experience. Many e-Merchant websites are just not easy to navigate to find the exact product(s) you want to buy. To make it even worse, most e-Merchants still have the default TEXT ONLY search — followed by a time-consuming checkout process. The EZeePRODUCT™ global product catalog is instrumental in solving for this problem that has existed since the first e-Merchant opened for business on the internet. EZeePRODUCT™ enables users to find products and brands from images (not from text) — either taken by the smartphone camera or shared directly from social media providers. Just like speech recognition will replace keyboards someday, EZeeBUY™ aims to replace search engines for any product by simply taking a picture or sharing an image from social media providers. In the next blog, we will discuss the patent pending EZeeDATA™ cloud-based dashboard service that leverages EZeePRODUCT™ to market advanced data analytics and insights on a global scale to brands, retailers, advertising agencies and data analysts.